Jon Kaase has won this year’s Amsoil Engine Masters Challenge Vintage class with a 473ci 1958 MEL (Mercury-Edsel-Lincoln) engine. Exploring the classic turf in distinctive fashion, it was not the first time Kaase had arrived with an unorthodox relic endowed with bewildering technology. Held annually in early October at the University of Northwestern Ohio, his entry produced 770hp with torque never less than 630lb-ft during the entire scored rpm range of 3,700-6,200rpm. The engine’s peak torque was recorded at 715lb-ft. 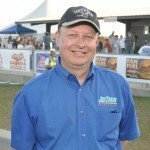 Earning a check in the sum of $13,700, it was Kaase’s seventh victory at the prestigious affair, which coincided a few days before his sixty-fifth birthday. Kaase’s principal task was to encourage more air flow to adhere to the port floor, enabling it to enter the combustion chamber by flowing around the full diameter of the valve head, rather than just one portion of it. To achieve this he introduced depth and a longer, more effective short turn. 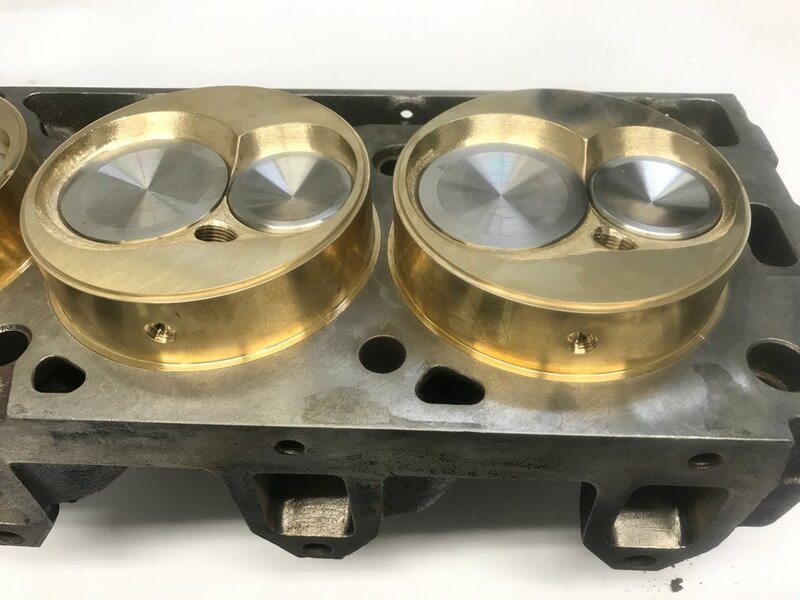 This year’s Vintage rules specified factory cast iron cylinder heads and prohibited welding or the application of epoxy to the ports. Also, it was stipulated that the engine block must retain its original bore spacing and original block deck angle. A further constraint for Kaase was the fact that he had to return the MEL block to its owner, Royce Brechler, in a functioning condition. 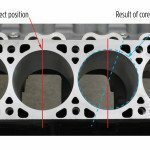 MEL engines had wedge-shaped combustion chambers formed between a flat cylinder head surface and an angle-milled block deck angle that was ten degrees off square with the bore axis. 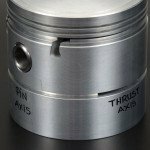 The piston crown determined the compression ratio and combustion chamber shape—a concept similar to Chevrolet’s 409, a design also introduced originally in 1958. 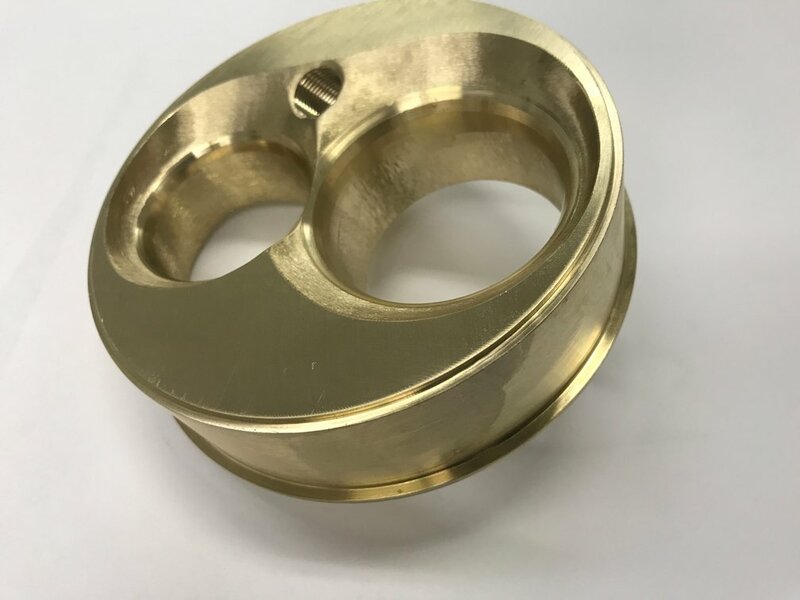 Large diameter round bronze bar was used to extend the distance of the combustion chambers from the valve bowls. 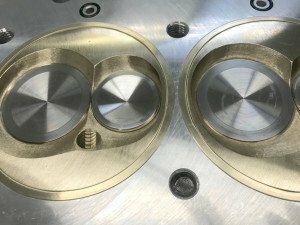 In so doing, Kaase created deeper valve bowls, taller and improved short-turn radii each with a long, effective smooth roll from the port floor down to the valve seat. 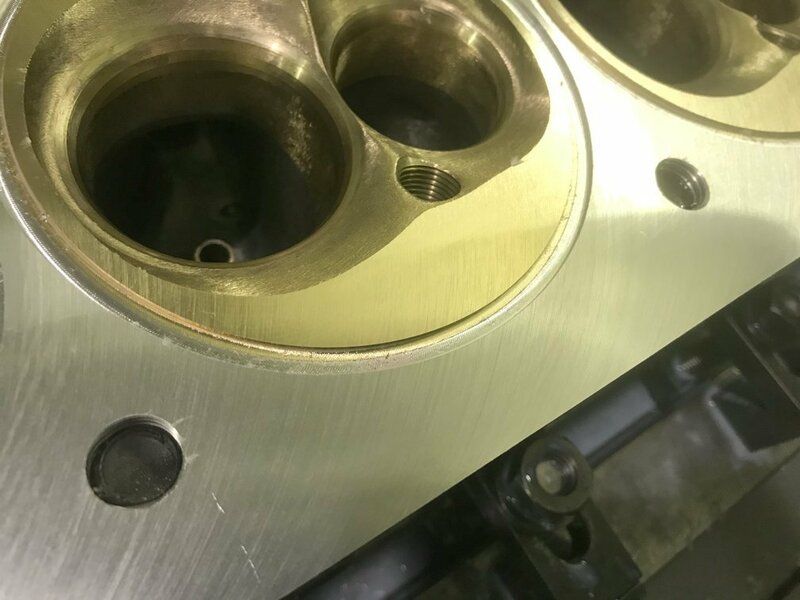 Yet to each cylinder head deck, Kaase added four slugs of round bronze bar stock by counter-boring the heads to accept them. Measuring 4.600in diameter and 1.250in tall and protruding downwards, each set of four round protrusions were placed within a four-hole spacer that acted as a head gasket. Pop Eyes: For some, the show’s most vivid moment occurred during the engine dismantling phase. With protrusions attached, silence pursued as Kaase’s heads were presented to the judges. What is this? Into each of their protruding bronze faces, he shaped a new combustion chamber and port entries. “I could have used cast iron,” he said, “but bronze is a little better in dissipating heat.” An ancient alloy, bronze consists of copper combined mostly with tin and has a melting point of 1675F. Ironically, the cost of 16 conventional C630 bronze valve seats is around $640; the large diameter bar stock that Kaase purchased for the project cost $500. Cooper rings made from 360 bronze were placed partly on the brass protrusions and partly on the metal spacers. 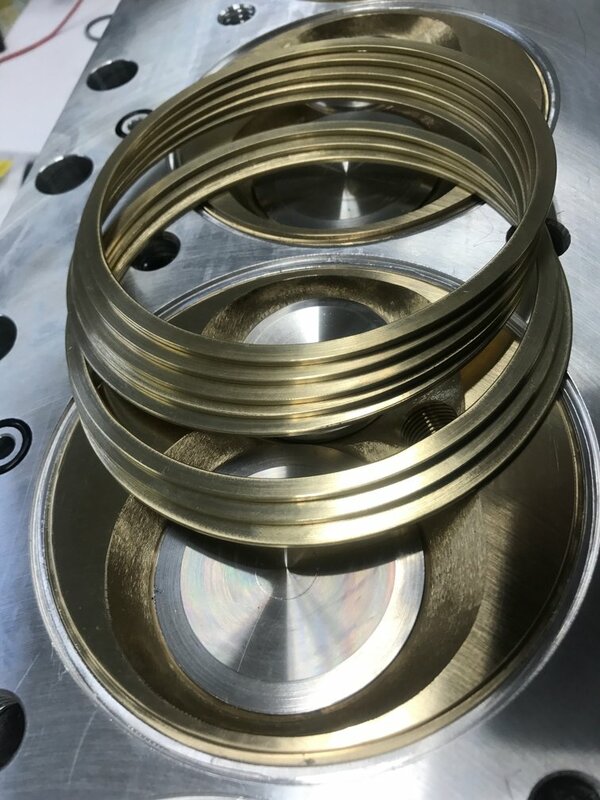 Sealing the combustion pressures was achieved by eight Cooper rings. These were made from 360 bronze and placed half on the protrusions and half on the metal spacers. Other sealing considerations were overcome by clamping forces, like components confined in a tight sandwich. Poor port design in the original MEL cylinder heads had stifled the engine’s airflow. The intake had a sharp edge close to the valve seat on its short turn portion. Consequently, airflow was diverted to the far side of the intake valve, instead of flowing evenly around the valve head. Mastering the inner game brought vintage triumph to the Ford MEL engine. 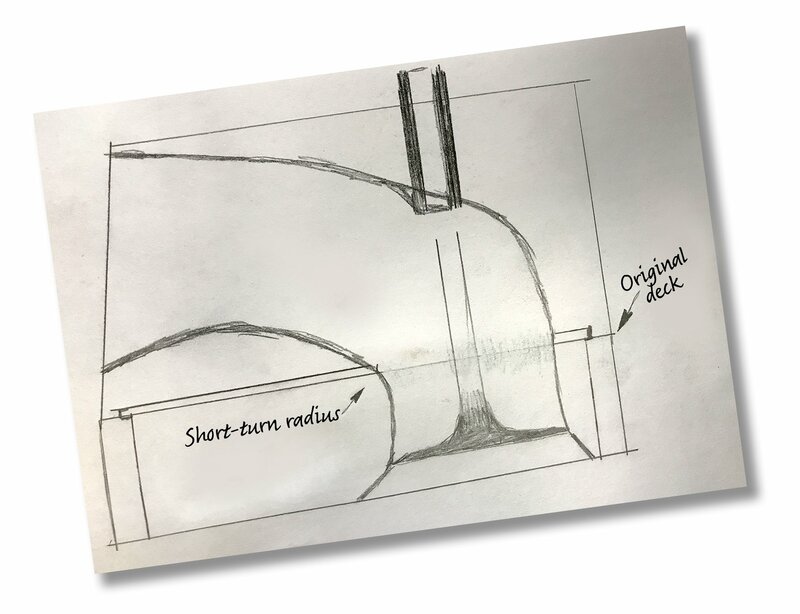 “The main priority,” says Kaase, “was to make the valve bowl deeper and to widen the radius of the short turn.” The new taller short turn meant it was easier for the airflow to remain attached to the port surface and, therefore, a better approach to the valve seat. 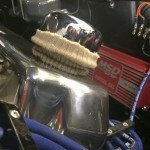 “By making it taller,” remarks Kaase, “it gave it a real nice long roll from the port floor down to the valve seat.” Presenting a smoother, less abrupt transition from the port to the chamber didn’t hurt the performance of the long-turn portion either or, for that matter, the exhaust performance—gas flow both in and out of the chamber was more efficient. Kaase has a reputation for beguiling engineering. Inspired by a similar encounter forty years earlier when working with Dyno Don Nicholson, this was his sequel. Energy, profound knowledge of engineering, and a touch of singularity have kept Kaase on the right side of history so far. Born and reared in Cleveland, OH, Jon Kaase made Atlanta his adopted home in his mid-twenties, establishing himself, like many before him, as a racing migrant from cooler climes. He made a career of race engine building and in the following forty years did nothing to sully his legacy. 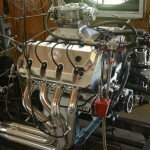 In fact, his reputation rests on a long list of engineering triumphs; the first of these dates back to the mid-1970s when, collaborating with Dyno Don Nicholson, he helped win the NHRA Pro Stock championship of 1977. A conspicuous coliseum of American race engine builders, this year’s event attracted over 600,000 video views during the cut and thrust of battle. Moreover, from its beginnings the Engine Masters Challenge established itself as a pinion of innovation, a whirling phenomenon that creates a frenetic moment in our lives each year. Let’s hope its appeal continues to thrive. Jon Kaase will be speaking at the 2018 AETC Conference, All-Star Engine Builder Panel, beginning Dec. 4th, Room 231-233, Indianapolis Convention Center. Visit the Kaase Racing Engines’ Booth # 2233 during the PRI show. You have an inner vision of engineering ability that never surprises me! I turned 59 this week; I’m a gearhead from the 60’s, and I was in high school back in the 70’s when Dyno Don Nicholson came to I-20 Dragway in Winona, TX., just outside of Tyler on hwy (155) North near my grandparents farm. Nicholson’s engine sounded like it had a muffled growl right before the rpms came to idle after he reved it up, and that sound has been stuck in my head all these years! Thru the years my engine interest was mostly Chevy and Mopar (440’s). 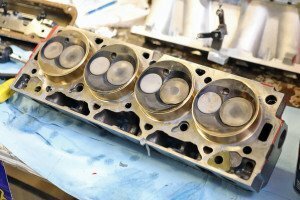 Today, thanks to your creation of P-38 “canted valve” heads, I can build my dream engine! 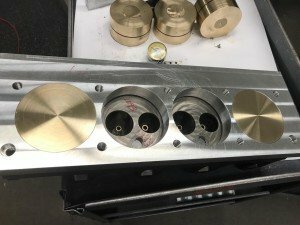 Initially, I was going to build an old-style 302 BOSS w/Cleveland heads but the day I saw the video of the horsepower produced on that stock engine equipped with the user friendly P-38s, I knew I had found the right heads for my Windsor block. I’m giving you my personal thanks for the creation of those heads and another thanks for sharing your inner visions of creativity with us and making these heads so user-friendly! Danny Shaw / Memphis, TN. 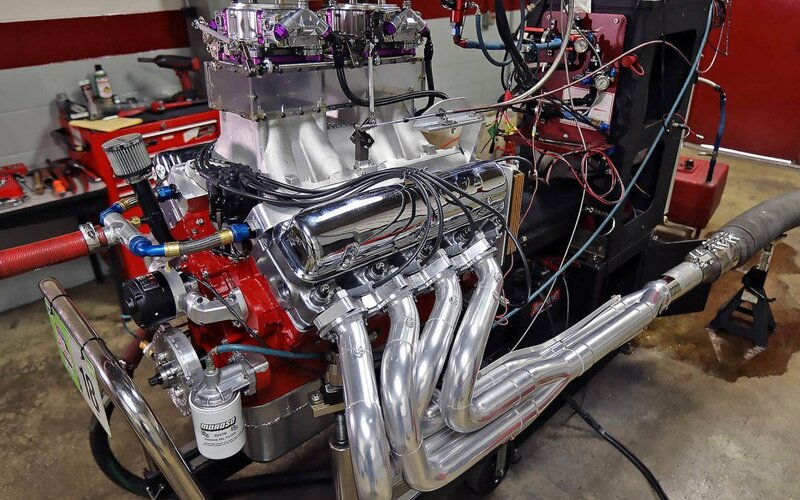 I remember back in high school, I read in Hot Rod Magazine about a guy who took a cast molding of the heads of a Mustang Funny Car and then worked out the tolerances, and at the time he was the most innovative engine builder of his era. Commendable! As stockers, the MEL’s were known as torque monsters. They needed to be to motivate 6,000-pound Lincolns with vigor. 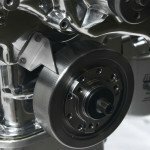 I had always heard that they were a low-rpm engine due to their heavy rotating assembly. Yet innovative engineering and know-how have, apparently, throw that out the window. Well done!